The Legendary Duke is one month old! 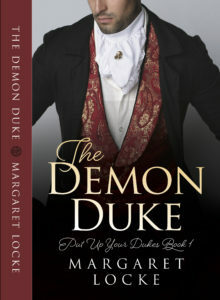 How does Nelle Greene feel about the enigmatic Gavin Knight, Duke of Cortleon? Memories of a night not so long ago and yet so far away, of a dance, of a look, of a kiss at midnight, attacked Nelle. Curse the man. He hounded her day and night. Yes, it was everything like that. Grand didn’t even begin to describe it. 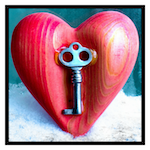 But she shook her head in response; some things were too private to share, even with her sister. He soaked in those blue eyes, eyes as blue as the paint Michelangelo had used on the Sistine Chapel. He’d thought nothing could render them more beautiful, yet the luxurious, deep hue of her dress magnified their brilliance. A delectable blush infused her cheeks, and a jaunty bonnet covered her hair. If only he could untie its ribbon and pull it off to let those tresses fall free. How long was her unbound hair? How would it feel caressing his shoulders? Her tongue darted out to lick at her lower lip, and desire punched him in the gut harder than Engelsfell’s fists. “Then I must slay him.” The words were said in jest, a response to her imagery, and yet she held her fingers to his lips to silence him. 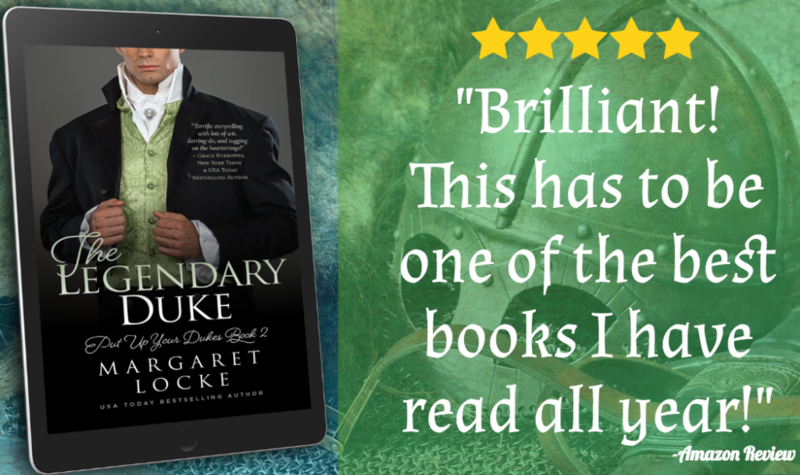 You don’t have to love Arthurian legends to fall for the Duke of Cortleon in this Regency historical romance. … He grabbed his father’s hand, fixing his eyes on the large ring, the one with the golden lion’s head on top of a red stone. 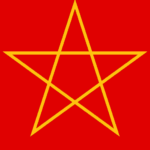 The Cortleon crest. Papa had told him he’d wear the ring when he was Duke. Upon deciding to write a Regency historical romance based on the Arthurian legend of Gawain and the Green Knight, my brain immediately spun with name possibilities. I adore crafting book titles and character names with meaning; it’s one of my favorite parts of the whole writing process! In fact, I adapted so many Arthurian/medieval-connected names for The Legendary Duke that I added a glossary at its end to explain their significence, should anyone besides me have interest. 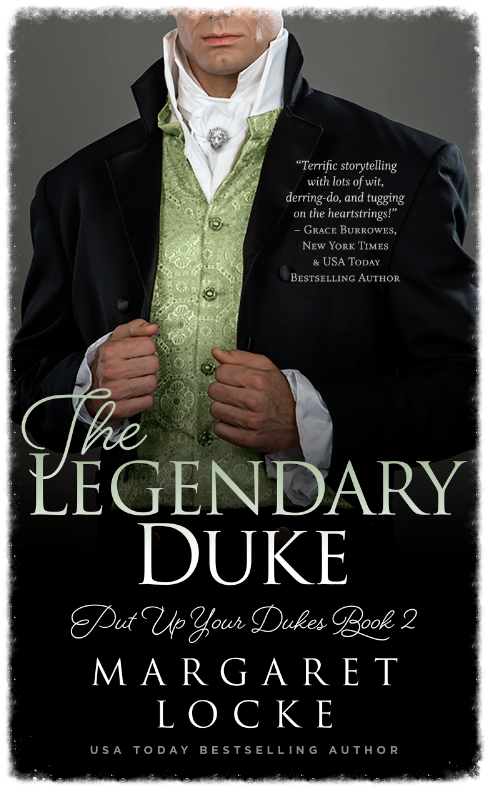 The Legendary Duke’s hero, our Regency version of Gawain, is Gavin Knight, Duke of Cortleon. 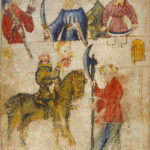 Gavin is the modern equivalent of Gawain, and Knight evokes both the Knight in the legend’s title and the medieval period in general. 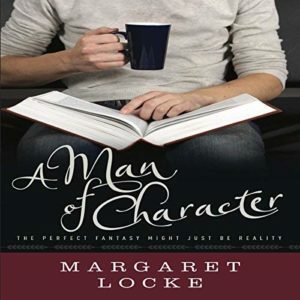 Cortleon, Gavin’s ducal title, is an amalgam of “courtly love” and “Caerleon” (a Welsh castle some consider the real site of Camelot), both relevant to this book’s Arthurian inspiration. But why a lion for his ducal signet? Well, not only have lions long been associated with England, but “leone” is Italian for lion. Given that Gavin, an English duke, spent most of his youth in Rome, the lion seemed his perfect symbol. devoid of villainy, his virtues were a court’s delight. 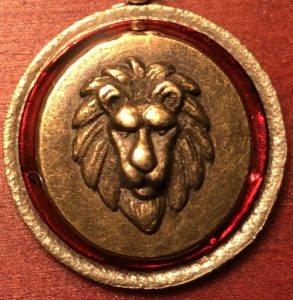 I combined this image with the lion’s head to form the Cortleon coat of arms and signet ring design but longed for a visual representation to inspire my writing (I’m a very visual person!). 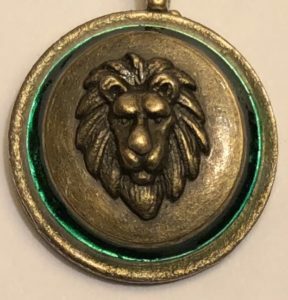 So, I googled around and stumbled across Lori Ferguson’s Etsy shop, Nature With You – and specifically this piece of jewelry (shown at the top of this post): https://www.etsy.com/listing/464109731/red-lion-necklace-mens-jewelry-lion. 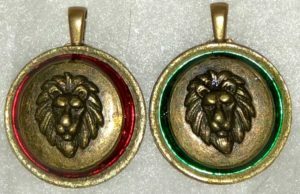 Absolutely elated with these two pieces, I contacted Ms. Ferguson to ask if there was any chance she’d be willing to let me use my personal photos of the lion charm in my promo for The Legendary Duke – and she graciously consented! Wahoo! I’m so thankful. Having these in hand certainly did influence my writing. I look forward to hearing what y’all think. I highly encourage you to check out her Nature With You Etsy shop – I also bought beautiful necklaces for my bestie and my cousin! Thank you a million times over, Lori! Your jewelry and this Regency-medieval mash up are now forever linked – at least in my head.